Haha i know. After i took the pic and looked at it, i thought the same thing. And before anyone crucifies me for not having a neonate in a tub, I have his temps, humidity, gradients and security all covered along with elevated water bowls on the second perch and top perch lol. Already got the sad face from a couple people on the chondro boards for me going from a tub to a display set up for a neo lol. I was like, well, if i get the gradient, temps, humidity and security all correct and he ate within an hour of being in the new cage, i must have something set up right. You went quick, that's true. That is a lot of changes in a short time. BUT !!! 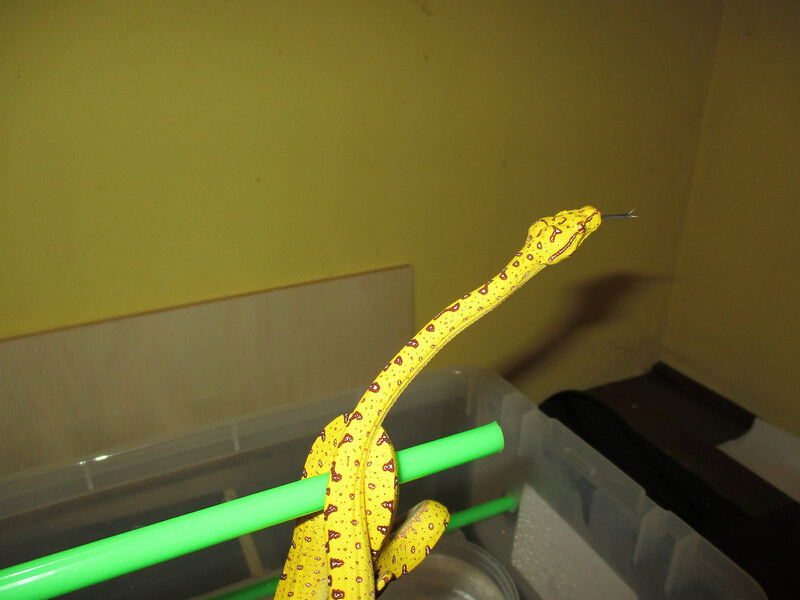 You obviously have a well adjusted little Chondro there. They "can" stress, but I don't think they stress in the same way then a Ball Python does. 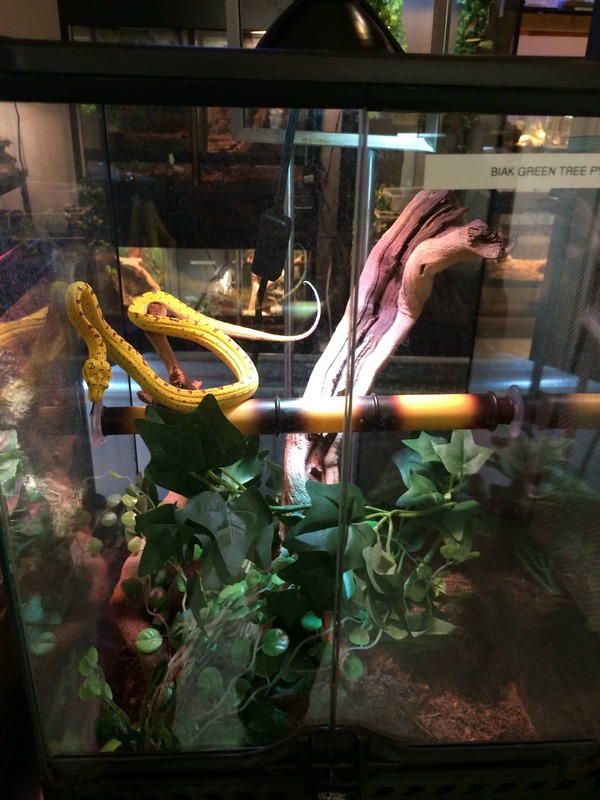 A Ball Python needs the correct setup AND a ton of privacy/left alone. I think with Chondros its vitally important that you have the setup right, the temps, humidity, perches, etc etc. But they do not stress as much about being out in the open, then a Ball Python per se. So...since you have your little cage dialed in perfectly, with plant cover, correct perches, water, etc etc, your baby should be just fine. Being willing to eat right after shows it didn't bother him much at all. 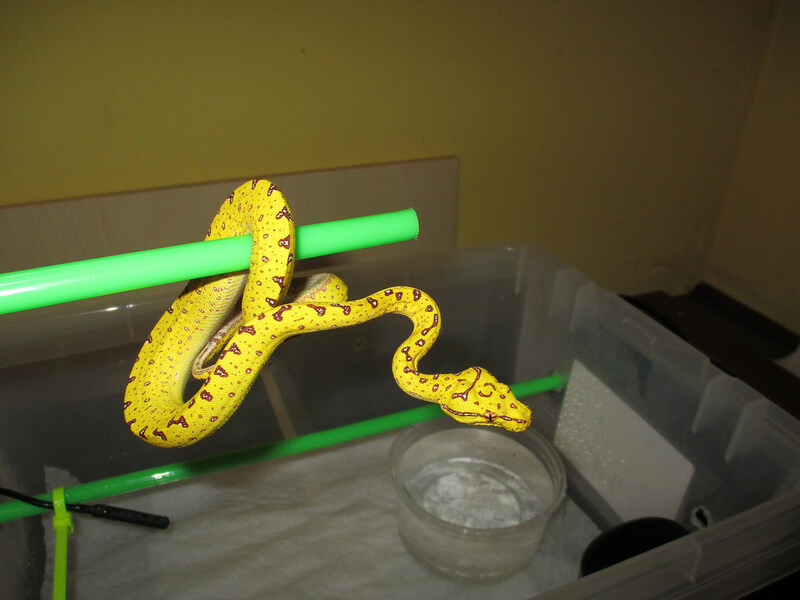 Some snakes go from breeder/tub to owner/glass tank (incorrectly set up at that) And that is when you run into problems. You didn't do that. You moved him. But you moved him into the "ideal" setup. OH WOW your little one is even smaller than mine. 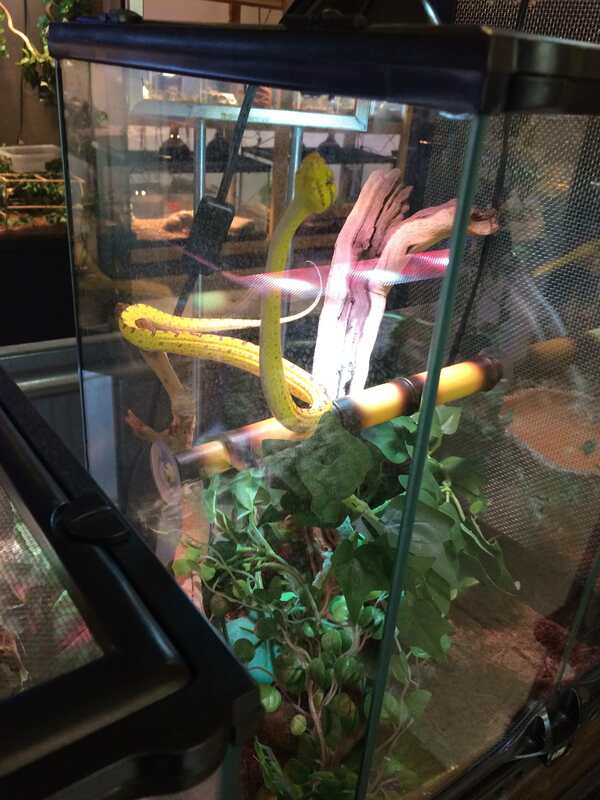 I would be terrified of losing mine if I put it in a bigger enclosure but then again I am doing exactly that with the 8' square cube I have on order. She seems so sad and bummed out in her quarantine tank but its is doing its job well for now. 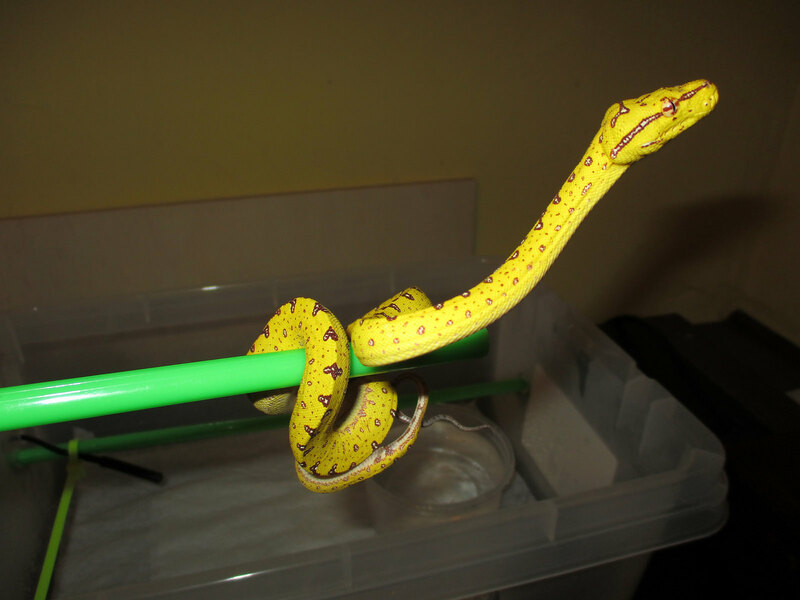 Or should I act like those people on the chondro FB pages and tell you how you are killing your snake and you need to get smaller perches and they need to be in a tub rabble rabble rabble! Last edited by SDA; 01-04-2018 at 02:30 PM. Oh yeah, he's tiny. The gal guessed he was probably around 3-6 months old. He is about 10-12 inches if that. And yeah when i first put him in a little 12 qt tub with the plastic coat hanger perches etc, he hated it. He spent the whole day and night moving, never perched and ended up grounded under the paper towels the next morning. Thats when i moved him into the 25 qt which he acted normal and ate. Then about 4 days later i couldnt stand the tub as i couldnt see squat so i went and set up his deluxe condo and like i said, he immediately took to it and ate again. And honestly, i only had 2 guys not really hate on it, but say i should leave neos in tubs. The rest of the people loved it and one guy said, he got the same response from the certain haters of the group about the cubes vs tubs for neos and he has the temps, security, gradients and humidity all set correct like me and his eats no problem as well and this was awhile ago and his is doing fine and didnt need to grow up in a tub. I did listen to the smaller perch thing though and my little guy has 3/8 inch perches and they seem to fit him perfect. WOW! i recall u had been looking for one for awhile, Congrats! Well, i decided the tub had to go. Couldnt see Pat or anything. Whats the point in a display animal if i cant display it!! So here is Pat's new digs. It's an 18x18x18 Zoo Med. He seems to like it as he was more than happy to go up to the top perch when i showed it to him while on his other perch. He then promoted to eat another pinkie mouse and now is back to sleeping under the heat. 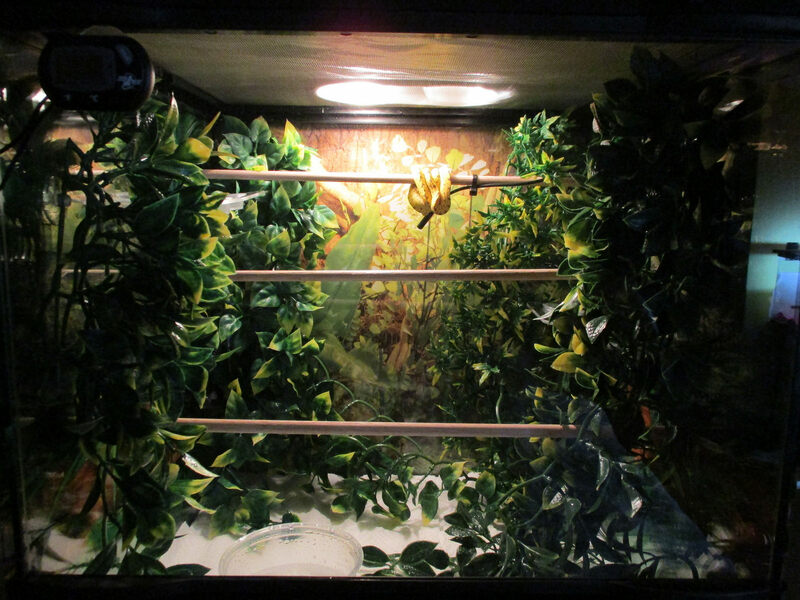 lol Mr. Minimalist cage guy made a rainforest cage! Looks awesome dude! should also do a red carpet rollout. Here's a guide you might wanna check out. I'm going to do something close for my 18x18x36 Exo Terra. Hey Sauzo you going to do live plants? I am really tempted to get some humidity control and because some vines would look amazing in a pvc cube. A few people on some of the chondro forums are talking about it and seem to love the benefit. I have a great grow light I may pick up if I go that route. No bio active shenanigans or substrate... puppy pads and a plant in a pot is what I am thinking of. Simple and easy to clean. Thinking either philodendron or pothos because they are easy to get and easy to maintain. Last edited by SDA; 01-04-2018 at 06:28 PM. Haha yep, i got it from Hewitt. I know the owner gal and i knew the old owner too before he sold it. I was originally going to do a bioactive set up in Pats 18x18x18 but i opted out. I'll most likely do one in his forever home with the AP 48x24x36 cage. I thought about sitcking a small pothos or Philo in Pats cage now in a pot but I'm waiting for him to settle in more before i clutter it up too much. I still want to see him to make sure everything is going ok.